Children ages 3 to 4 are part of this program. The beginning process of phonetic reading formally begins at this phase. It is at this age when children, once they master to speak, start enjoying to read in an effortless manner. Children in these program are within the age range of 4 to 6 years and 6 to 7 years respectively. 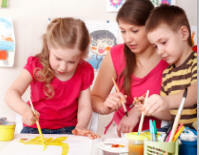 Our programs are a philosophical extension of the preschool, with a curriculum consisting of the traditional disciplines.